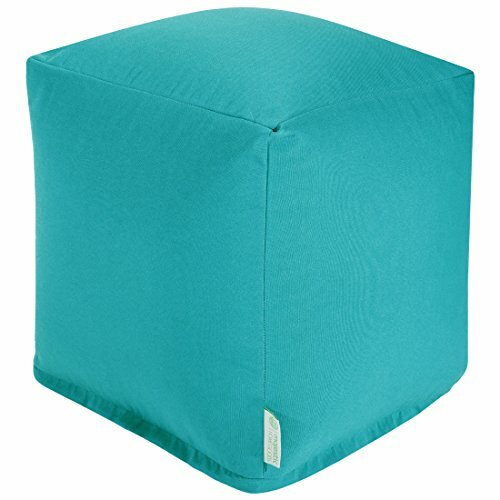 Add style and color to your living room or outdoor seating arrangement with Majestic Home Goods Teal Small Cube Ottoman. This cube is perfect for use as a footstool, side table or as extra seating for guests. Woven from outdoor treated polyester, these cubes have up to 1000 hours of U.V. protection and are able to withstand all of nature’s elements. The Ottoman pouf cube feature a zippered slipcover. Spot clean slipcover with mild detergent and hang dry. Do not wash insert. Warranty Disclaimer: Please be aware that there may be sellers selling counterfeit goods or imitations. Buy from Majestic Home Goods authorized sellers only. Counterfeit Goods are not covered under warranty. These Counterfeit Goods may not meet Majestic Home Goods specifications with respect to quality or other issues.